In 1979, the University decided to set up a new BSc course named Physics with Astrophysics, as a joint venture between the Department of Physics and the then separate, Space Research Department. A plan to build an undergraduate Observatory was suggested by Dr Ken Elliott and he presented a proposal to the Space Research Group Committee so that students could have access to a telescope to make their own observations. The handwritten proposal can be seen in full here. The proposal was successful, and Dr Chris Eyles and Dr Ken Elliott then visited the telescope manufacturers, (Astronomical Equipment Ltd) to discuss various possible telescope configurations. 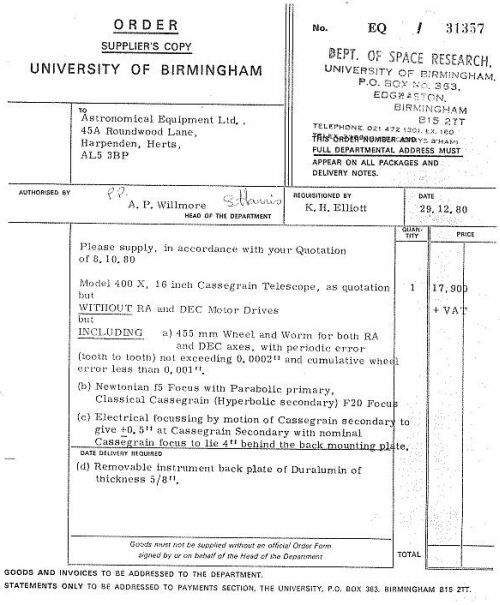 In October 1980 a a quote of £19,400 for the telescope was received, quickly followed by a bid to the University for a total of £30,000. This would be to cover the cost of the telescope, drive electronics (which was constructed in house by Dr Eyles) and dome. 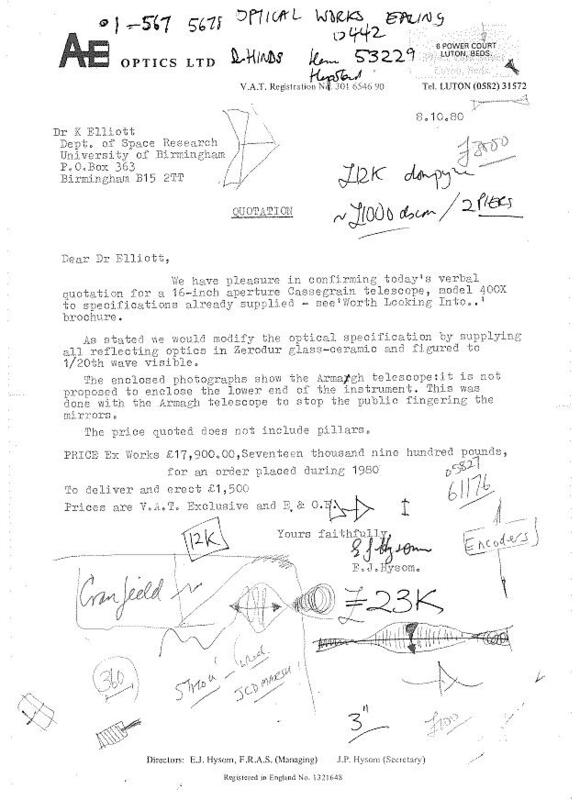 This too was successful late in December 1980 and so shortly before before New Year (29th December), Dr Elliott placed the order for the telescope. This order was narrowly in before financial cuts to universities were announced in January 1981 which resulted in the University telling the group not to place any new large orders! As the telescope was ordered, the plans for the establishment of the Observatory could not be stopped. Sky brightness measurements were made on the Poynting Physics building roof and at the University playing fields at Wast Hills. The sky at Wast Hill was ~100 times darker than on campus, (prior to the installation of floodlights for the campus hockey pitches). 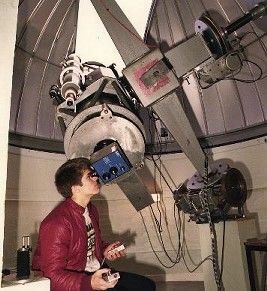 It was decided to build the observatory at the Wast Hills site. 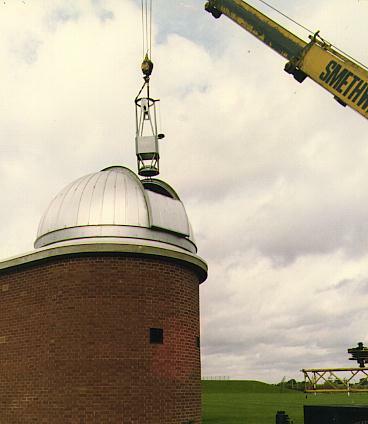 A further bid to the University for £22,000 to construct the observatory building was made and granted. 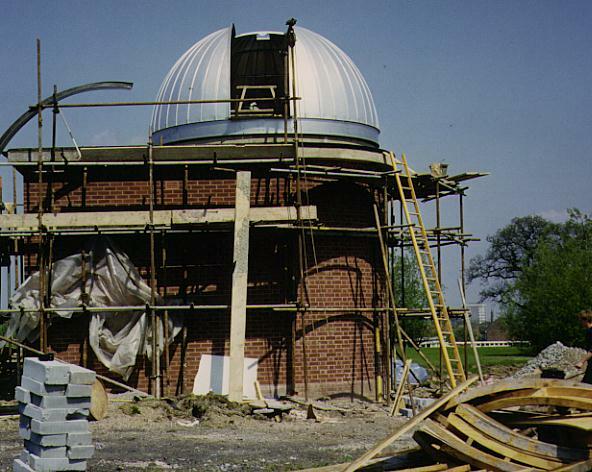 During 1981, plans for the Observatory were drawn up, planning permission sought and builders selected. As the telescope was to be of an equatorial English mount, with the polar axis aligned North-South, the building also had to be aligned exactly N-S. On December 18th 1981, a North-South line was staked out in the snow, using a theodolite, to observe a meridian transit of the Sun. 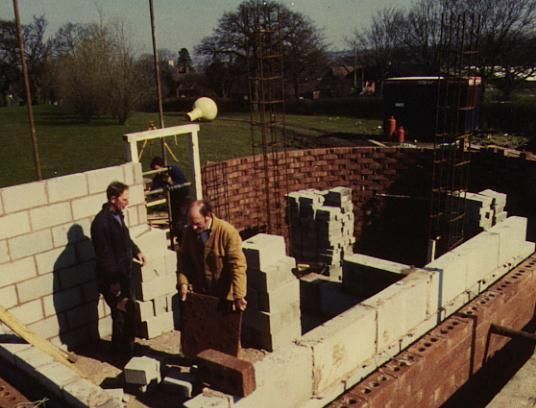 The first foundation trenches were dug in Jan 1982 and the building rapidly continued, and the Ash Dome was built. It was not until after the building was complete and that the concrete piers for the mount were cast that it was found that the building was slightly out of alignment with the North-South line. Fortunately the telescope mount was able to be adjusted to correct for this and was then properly aligned. Meanwhile the telescope was delivered to the University and was built and tested in one of the huts outside the Physics Poynting building. 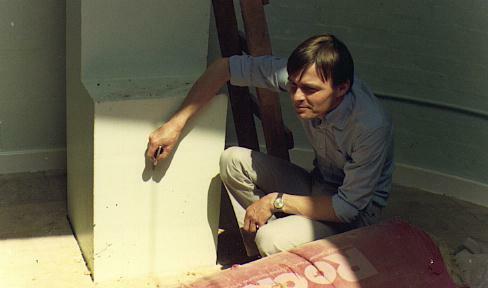 During this period the computer servo control system was successfully tested and a telescope control program was developed by Dr Elliott with help from Patrick Wallace. The computer used at this stage was a DEC PDP 11 minicomputer with 24 kilobytes of memory. The telescope was then transported from the campus, was lowered into position on 28th September 1982 and re-assembled whilst hanging from the crane. The construction took 6 hours much of it in a heavy rain storm. 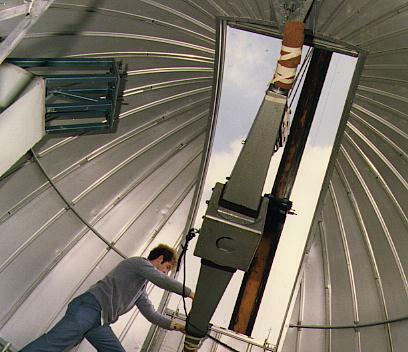 The mirror and cell was installed on November 3rd 1982 and first light was on December 8th 1982. 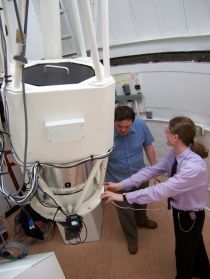 Computer control was yet to be installed so two students , Richard Saxton and Geoff Mellor, turned the RA flywheel by hand to keep the telescope tracking. Details of the first few pages of the Observatory Log book can be seen here. 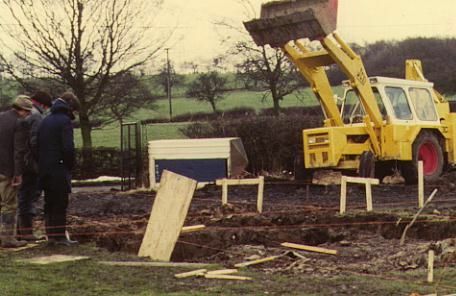 On 10th January 1983, the telescope first slewed and tracked under computer control. These original observations were photographic, either by imaging at the Newtonian focus or by means of a low dispersion spectrograph, which employed a grating in the converging Cassegrain beam. 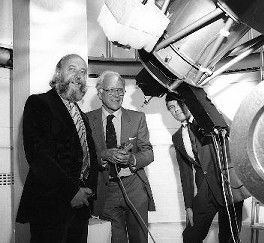 On 13th June 1984 Observatory had its official opening by the Astronomer Royal, Professor F G Smith. The official opening in June 1984. Left to right: Prof. Peter Willmore, Astronomer Royal Prof. F.G. Smith and Dr Ken Elliott. In 1984 a UBV photometer was obtained from EMI-Gencom which had to be interfaced to an Acorn A5000 computer to allow high speed photometry. This was used extensively for photometry of short period variables. In 1985 as zoom lens spectrograph was built by Applied Photophysics. It was originally used with a 35mm camera using Kodak Spectroscopic film as the detector. 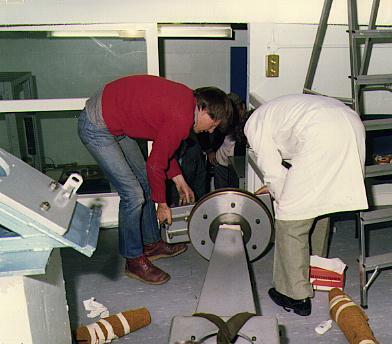 A new primary mirror cell and support system was installed in 1986 with an intensified acquisition camera and auxiliary optics for spectrograph slit viewing and spectral lamp calibration. A CCD camera using an EEV P8603 device was designed by Dr Elliott in 1987, and was built in house. The CCD was controlled by a BBC Master computer using code written by Rob Jeffries as a second year student. The spectrograph was modified to have a turret with 3 gratings allowing it to be used for a much greater variety of observations. 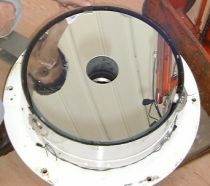 This CCD camera was used as the detector for the spectrograph until February 1998, when it was decommissioned and replaced with an Apogee AP7 CCD Camera. The original Cassegrain secondary support consisted of a single vane, which was rigid in the East-West direction but flexible in the North-South line. A new top end was designed in 1994 with interchangeable Cassegrain and Prime Focus operations together a new Cassegrain support system was built with a rigid pyramid structure to improve the pointing. The original control room. Left: a DEC PDP11 which controlled the telescope. 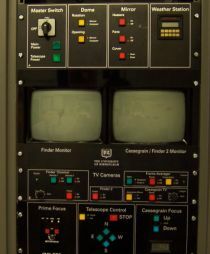 Centre: a BBC computer which controlled the UBV photometer. 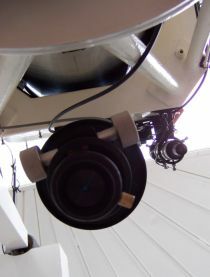 In 2006 a 14" Meade LX200R Schmidt-Cassegrain telescope was installed alongside the main 16" telescope. 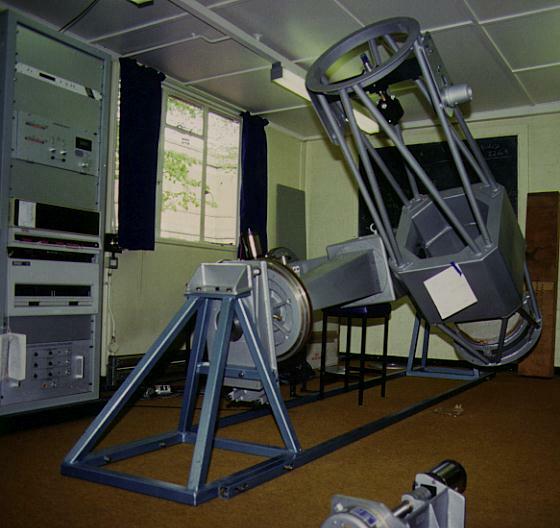 This telescope and the SBIG STL-1001E CCD camera that was installed with it was well suited for wide field imaging and photometry. Following this Prime Focus operations were decommissioned. 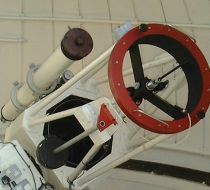 A major upgrade to the observatory is underway in 2013, including the commissioning of a new telescope, intruments, and telescope control systems. We anticipate announcing further details in autumn 2013.